Pure Silk Scarves, hand painted Performance Artwear. The ranges of Harp Silks and Performance Artwear stem from the encouragement, expertise, and persistence of California based Harpist, Carolyn Sykes MFA. Carolyn saw in Brilliant Silk the opportunity to produce a range of hand painted Harp Silk Scarves specifically for harpists, musicians and music lovers: plus Performance Artwear - dramatic garments specifically created for the professional Performance Artist. Designs include concert, folk and ancient harps , musical notes and designs. 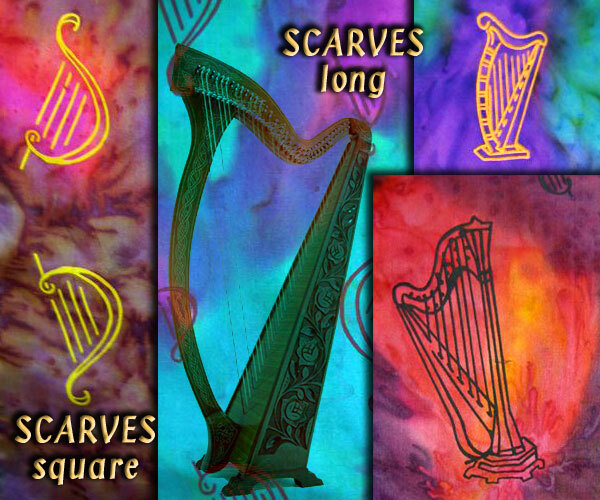 The Brilliant harp designs complement our hand printed and hand painted Celtic Art shawls, square scarves and long scarves.